The mark on the knives is for Saglier Freres, successor to Victor Saglier (1809-1894), a well-known Paris Art Nouveau silver maker who worked largely in plate but also solid silver. Sons Eugene and Andre continued the business until after World War II. 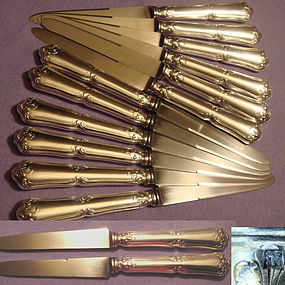 These knives, 8-3/8” long, could be for lunch, dessert, cheese – or whatever – and probably date from about 1900-1910. The classic form is punctuated with acanthus leaves and can complement many Nouveau or simpler patterns. The silver is in fine condition for its 100 years – no hint of plate wear, splitting, or pitting. I had thought for many years they were solid silver, but the marks tell me otherwise. The blades seem to be an early form of stainless introduced soon after 1900, and marked with an “I” in a lozenge – possibly the early logo of Inox – and are quite sharp with no discoloration. These are very nice knives! Price is for the set, but will consider fewer.